Have you started Checking FFS 2018 Shortlisted Candidates on CDFIPB Portal, if no then these post is meant for you. 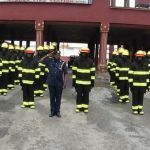 You can recall that sometime ago, applicants where called to come for registration for the federal fire service (FFS) via CDFIPB portal for eligible candidates who are willing to join the services. Here and now is the List of successful candidates are out and they are splitted into two sections. You can use the link below to check if you have been selected to continue the course. Mind you, If you open the link, you will need to click for which you register for, if its for junior click junior applications and if its for senior, click senior applications. If you need any help or your name is not listed, just hit the comment button and we will assist you in whatever way.